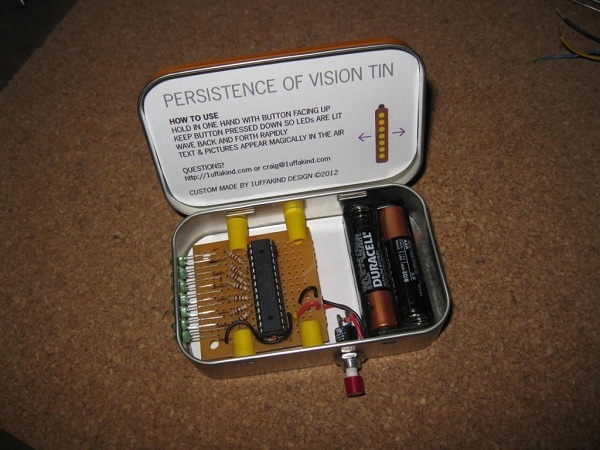 Here’s a handheld POV toy packed into an Altoids tin. The brain of this device is a Parallax SX microcontroller, while it’s powered with two AAA batteries. 7 LEDs provide the POV display that is capable of storing 32 messages. There are 32 message slots — 16 are straight hard coded bitmaps, 16 are text strings of any length. The text strings are mapped to ASCII character bitmaps with one extra trick — the engine will look for a break in the text string (a space character) after a set number of characters, and show JUST THAT PORTION of the string for 4 seconds or so, then it moves on to the next portion of the string. This entry was posted on Monday, December 3rd, 2012 at 11:00 am	and is filed under POV Toy. You can follow any responses to this entry through the RSS 2.0 feed. You can skip to the end and leave a response. Pinging is currently not allowed. I wanted to purchase POV kit, how to purchase it, whome to contact regarding this. Can i get contact number of the concern person so that i can contact him.